If you write about a song the day it premieres, you can give a decent hot take on the track, but you can't live with a song to really understand what makes it tick. More than any other medium of art, music invites familiarity so we want to introduce a new weekly series, 'Single Serving,' where we look at tracks that we've fallen in love with (that are at least one month old but no more than six that are in contenders for any 'Song of the Year' list we'd put together) in a more substantive way than a simple blog post. We have a serious lack of male pop stars in 2015. Ignoring the debate of what precisely "pop" is, most of the male pop stars that are going to immediately spring to mind -- The Weeknd, Hozier, Sam Smith -- are crossover artists. They've written tracks in a specific genre -- R&B, folk, soul, etc. -- that took over the Billboard charts anyways. There are straight up male pop stars today; the reinvention of Justin Bieber this year is a perfect example. But outside of the "child star reinventing himself" circuit, they're few and far between. Years & Years has proven to be the perfect tonic to this particular demographic deficiency in contemporary pop. If you're from the UK, your familiarity with Years & Years is much higher than most of us across the pond. 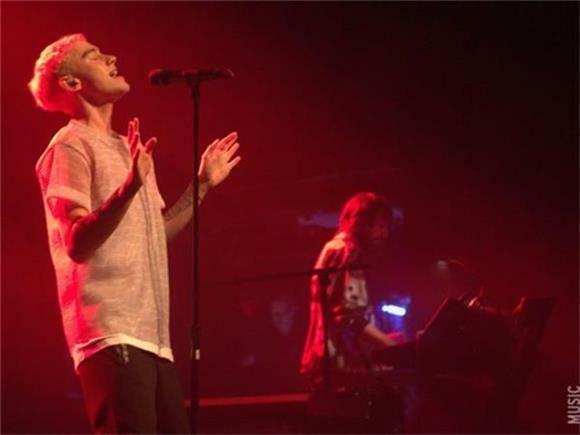 Years & Years took the UK charts by storm when their single, "King" debuted at the #1 position. With a slew of other charting singles and their album Communion (which debuted at #1 on the album charts), Years & Years have joined Chvrches as part of a wave of UK pop acts crashing against American shores without representing typical bubblegum pop. The specific trend of UK pop acts hitting our shores are bands that blend arena ready pop hooks with dance floor ready rhythms and beats. If the American synthpop revival (Passion Pit, Chairlift, Neon Indian, etc.) has seen a resurgence of the ice cold beats of 80s New Wave, the UK has seen a resurgence of the house/techno pulse of the 90s. And although Years & Years bristled in an interview with us once against the label "house," it's possible to hear the DNA of the rich legacy of British dance music even in their biggest pop smash, "King." But all of this philosophizing about the cultural influences that birthed "King" and Communion doesn't answer the simple question of "Why has 'King' been playing non-stop in the Baeble offices for months now?" There are a host of reasons; this is a track that you can play on a loop and by which find yourself totally hypnotized or you can dive into it in a more analytical sense and really wrestle with the tale of repressed heartache that Olly Alexander is spinning. But it doesn't hurt from the moment that you press play, the skittering vocoder sample grabs you by the throat. As a critic, it can be hard to admit how important a great hook is. Hooks short-circuit your critical faculties. They operate at a damn near biological level. A hook either works or it doesn't, and there's nothing a critic hates more than admitting that there are mechanical elements to the medium he writes about (and that mechanical elements can be as good as artsier pretensions). And while (thankfully) there's more to "King" than that staggeringly good synth hook, we're grateful that there are still mainstream pop artists capable of crafting a hook as all-consuming as Years & Years. But if there's more to the track than the immensity of that hook, what is that "X" factor that transformed "King" into one of the year's best tracks? One of the reasons that Sam Smith has always struck a flat note in his solo work is that he sings about vulnerability, but these songs aren't reflections of who he is. They remove personality to try and capture the heyday of the male soul singer without recognizing that it was sincere pain and pathos that made Otis Redding/Smokey Robinson/Al Green legends. Sam Smith hides behind sweeping production without baring his soul to every listener. Olly Alexander doesn't have that problem. Olly Alexander is a rarity in contemporary pop music. He's a queer male musician who sings about his own queerness. And rather than trying to wear the traditional mantle of sensitive but aloof poet who keeps his feelings at a measured distance (which is the look du jour of most contemporary "sensitive" male rock stars or songwriters), Olly Alexander lets his feelings out in a howl that is both wounded and triumphant. For every guy who's ever wanted to just feel without having to apologize for our own frailties but can't because...patriarchy, Olly Alexander is our unconventional knight in shining armor, spinning tales of heartbreak and lust and desire with the sort of vulnerability that is generally only afforded to female pop artists. It's clear that "King" isn't going to take the American listening public as overwhelmingly and immediately as it did the British. It peaked at 37 on our charts (which is pretty damn good for an American debut by a relatively unknown band). But this is the sort of track that sinks its claws into a listener in a way that you want to tell all of your friends to listen to it. You don't just want to pass this melody on like a virus; you are physiologically compelled to do so. And when Years & Years finally make their way back to our shores, we're pretty sure our charts will be more ready for their British invasion.